What Does the Healthcare Industry Need from a Storage Solution? environment, and becomes a key component in cloud computing—providing Information Technology as a Service (ITaaS). Insight Integrated Systems can help you accomplish all of this with lower total cost of ownership and dramatically simplified management, enabling you to leverage your resources for optimal return on investment. want to optimize revenue opportunities, reduce storage costs, and provide a stable foundation for growth. We maintain close relationships with industryleaders, while remaining vendor independent to provide a best-of-breed solution that meets the special requirements of your organization. 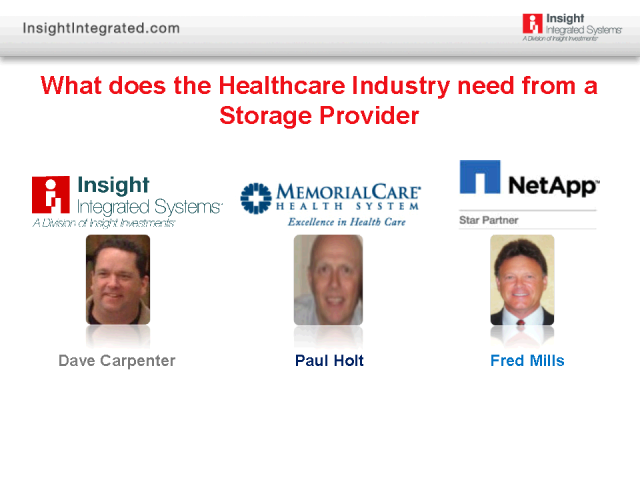 Title: What Does the Healthcare Industry Need from a Storage Solution?